Geoffrey K. Fleming and Amy Kasuga Folk, 2009. Hotels and Inns of Long Island’s North Fork. Charleston, S.C.: The History Press. Photographs. Pp. 156. ISBN: 1596297255. $21.99. In their delightful book, Hotels and Inns of Long Island’s North Fork, Geoffrey K. Fleming and Amy Kasuga Folk have captured the spirit of a vacation destination that has been luring visitors for three centuries. Divided into eight beautifully illustrated chapters, each with an overview of the type of accommodations depicted and described therein, the volume begins with early taverns and inns and ends with the bed and breakfast establishments that have proliferated on the North Fork in the early 21st century. Of particular interest is the discussion of the growth of tourism following the completion of the Long Island Rail Road to Greenport in the mid-19th century. Equally fascinating are the observations about the democratization of vacations in the post-Civil War period when leisure time for the working class became more abundant. The removal of menhaden processing plants from Greenport and other North Fork locations also spurred tourism as their foul fragrance was replaced by the bracing scent of the sea and country air. In addition to clean air, the region’s abundant recreational opportunities constituted another powerful draw. For active sportsman, fishing, hunting, boating and swimming were all available. For spectators, there was harness racing at tracks in Peconic, Southold and Greenport. If all of this activity whetted a visitor’s appetite for something stronger than lemonade, a stop at one of the area’s many bars was in order. The proprietor of the Southold Hotel even distributed coins entitling guests to a free drink. A picture of one of these special coins bearing the name of the hotel is included in the fascinating chapter on hotels. This section also covers the progression of the Claudio family from liquor dealers, beginning in 1880, to hoteliers and restaurant owners. Greenport, where Claudio’s restaurant continues to thrive, was a favorite destination of rumrunners during Prohibition. Fleming and Folk devote a chapter to rum running and houses of ill repute, noting that the North Fork “was once one of the largest entry points for the distribution of illegal alcohol in the country.” In an earlier chapter they include a wonderful picture, spanning two pages, of the alcohol-free Bay House in Orient, a community where the temperance movement was particularly strong. The most famous Orient hostelry, the Orient Point Inn, is accorded its own chapter tracing the history of the establishment from the second half of the 17th century to its decrepitude and demolition three hundred years later. In the interim, famous people stayed at the inn, which was initially a stopping place for ferry passengers traveling between the North Fork and New England and, in the 19th century, a vacation destination in its own right. James Fenimore Cooper wrote his novel Sea Lions while residing at the Orient Point Inn. Another celebrated writer, Walt Whitman, is believed to have stayed there and Senator Daniel Webster may have stopped there as well. Gazing at the handsome illustrations of the hotel, one can easily see why travelers flocked to the place. But time marches on and it can be detrimental to old buildings as evidenced by two interior photographs, circa 1970, showing the building’s marked deterioration from twenty years earlier, when the front lobby had an intact fireplace. Viewing these photographs, the reader instantly comprehends why the building could not be saved, despite the efforts of Orient preservationists. A grand hotel that would have rivaled the Orient Point Inn had it been built was the proposed Peconic Park Hotel. A sprawling turreted structure, depicted in an appealing 1883 illustration, the hotel was to have been the focal point of a resort on Nassau Point in Cutchogue. Guests would have accessed the hotel on a spur intersecting with the Long Island Rail Road and once at the resort they would have enjoyed aquatic and equestrian pastimes. None of this came to pass and the beautiful peninsula jutting out into Peconic Bay was subdivided for building lots. Elsewhere on the North Fork, resorts, admittedly less grand than the one proposed for Nassau Point, thrived into the 20th century. Among them was an establishment overlooking Long Island Sound at Horton’s Point in Southold. Known initially as the Paumonok Inn, which advertised that it was “swept from north and south by the never-failing sea breeze,” the hotel was later called Sound View House and the Horton Point Hotel. It encompassed a cottage colony with shingle-style houses, some of which are now year-round homes. In another part of Southold, Fishers Island, a place located so close to Connecticut that one sometimes forgets it is part of Long Island, there were enormous hotels. The Mansion House, the Mononotto Hotel and the Munnatawket Hotel, which are featured in the resorts chapter, together accommodated over 600 guests. Juxtaposed with two of the Fishers Island pictures is an illustration of the Arshamomaque Inn which opened in 1921 on Peconic Bay in Southold in what subsequently became known as Beixedon Estates. One is struck by the architectural similarity of this inn to the Mansion House on Fishers Island but unlike the latter establishment, which ceased operating in 1941 and was demolished, except for the still standing 19th century home that had been the nucleus of the hotel, the Arshamomaque Inn fell victim to fire, also in 1941. By that time its owner, Bennett Beixedon, was deceased and his widow was forced to sell the surviving cottages on the resort’s property. Fire was a recurring threat to North Fork hostelries. The Miamogue Hotel, which the co-authors point out was the first of the big hotels constructed in South Jamesport, was completely leveled by fire in 1895 only twenty years after it opened. 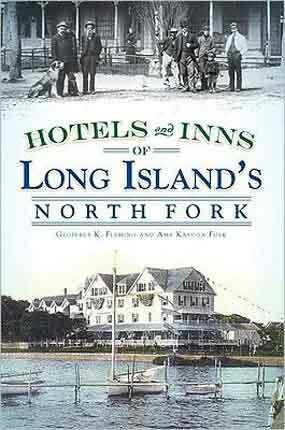 Happily, the establishments included in the final chapters of Hotels and Inns of Long Island’s North Fork are less prone to destruction by fire either because fire retardant materials were used in their construction or alarm and sprinkler systems stand ready to react at the first hint of smoke or flames. Nevertheless, a number of units at the Soundview Inn in Greenport were destroyed in a wintery blaze several years ago. The Soundview and other establishments familiar to today’s visitors to the North Fork are included in a chapter on motels. Commencing with an informative overview that explains the paucity of motels prior to the completion of the Long Island Expressway to Riverhead in 1973, this section of the book contains advertisements as well as photographs of area motels. Included is a mid-1960s depiction of the Silver Sands Motel in Greenport, one of more than a half dozen two-page spreads. These large illustrations, as well as all of the other well-chosen pictures, make this volume a most welcome addition to the growing list of books on the history of the East End. Like other recent History Press publications dealing with the North and South Forks, including Southold Reminiscences, edited by Geoffrey Fleming, this is a book that will appeal to both historians and the general reader. Strategic placement of the book in the gift shops of the North Fork’s numerous wineries and at registration desks in the area’s bed and breakfasts, many of which are depicted in the book’s concluding chapter, will surely increase sales of this volume which has the potential to become a regional best seller.